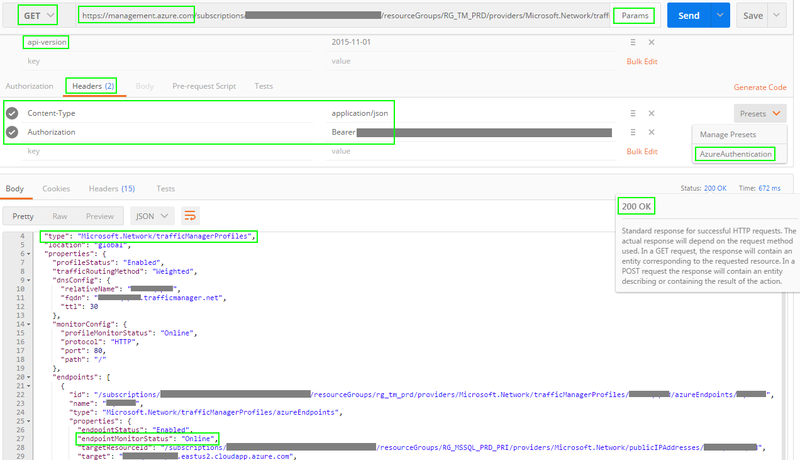 call to Azure Service Management REST API. Powershell - used to obtain a Bearer Token which is required for Azure SM REST API Header Authorization. Chrome PostMan - used to submit the API call and get a response back indicating the Traffic Manager EndPoints Monitor Status. Note: The Bearer Token from Powershell must be on a single-line. Use NotePad++..Edit..Line Operations..Join Lines if needed. If not on a single-line you will likely see a 401 Invalid Token error. Next, submit a call to the Azure Service Management REST API using GET. The below example gets the Traffic Manager EndPoints Monitor Status. That's it! Now you have the Traffic Manager EndPoints Monitor Status via an authenticated REST API call. Powershell and update that value in Postman. "message": "The access token expiry UTC time '3/16/2016 5:38:33 PM' is earlier than current UTC time '3/16/2016 5:47:28 PM'."